Hibernation is enabled by default in several Windows versions such as Windows Vista and Windows 7, and can be enabled in Windows 10, Windows 8.1, Windows 8 or later, and is one of the possible seven options (i.e. Hibernate, Shutdown, Sleep, Restart, Disconnect, etc.) that can appear on the Windows Power menu. Hibernate your Windows system will enable you to quickly restore to existing system state and intact workspace instead of start afresh, run programs and open your documents one by one again. Hibernation is enabled by default on some versions of Windows and some form factors of computers. If you do not use the hibernate feature in Windows, or prefer Sleep function, and want to delete hiberfil.sys and then recover the space occupied by the big hibernation storage file, the hibernation function can be turned off and disabled. Unlike Windows XP, users cannot turn the hibernation on or off via Windows GUI interface anymore since Windows Vista. Previously users can enable or disable hibernation via Power Options applet in Control Panel. This option no longer available in Windows Vista, Windows 7, Windows 8, Windows 8.1 and Windows 10. Instead, users have to rely on command line utility Powercf and/or Disk Cleanup Wizard to disable hibernation in them. Microsoft KB920730 provides details on how to disable and turn off hibernation on computer running Windows system. You must log on to Windows with user account in Administrators group to perform these action. In the search results list, right-click Command Prompt or Cmd, and then click Run as Administrator on the pop up contextual menu. If you are prompted by User Account Control for permission, click Continue or Yes. Another easier workaround for those who’re not comfortable to work with command line is to disable hibernation and hybrid sleep feature in Windows Vista is by using Disk Cleanup wizard tool, the built-in Windows disk cleaner to delete hiberfil.sys file. The hibernation file must be enabled to access the hybrid sleep feature and the hibernation feature in Windows Vista. Click Start button, then go to All Programs -> Accessories -> System Tools, and run Disk Cleanup. Choose which files to clean up, either My files only or Files from all users on this computer is fine. On “Drive Selection”, select the Windows Vista boot drive to clean up. Note that you must select the drive where Vista is installed, which normally is also the boot drive (C:) as hiberfil.sys file will be located on the root folder of it. 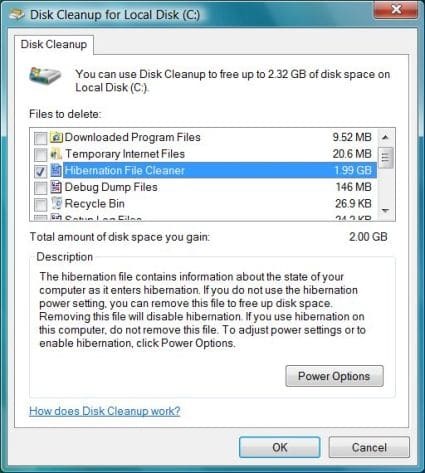 Once Disk Cleanup finishes scanning the system, Disk Cleanup for Vista window will open. Select and tick the check box next to the Hibernation File Cleaner. You can select or deselect other type files to clean or preserve from the available items or options in the list provided. Click OK button when done. Hibernation will now be removed and disabled.